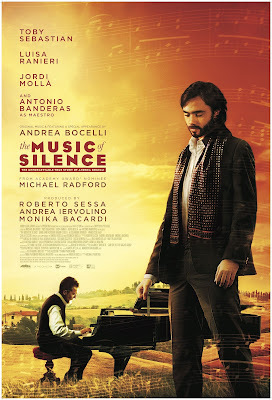 The Music of Silence is based on the true story of opera singer Andrea Bocelli, that was adapted from an autobiographical novel from Bocelli himself. This was another film that wasn't particularly bad; there were no outstanding plot holes, edits, or problems within the story structure, but I do think that this film suffers from something that isn't necessarily its fault; that being that if you are not a huge fan of Andrea Bocelli or at the very least know much about him, then I do think that you'll find watching this movie a chore. The personal knowledge that I had of Andrea Bocelli was pretty limited. I knew that he was an opera singer and that was it. The fact of his blindness was a bit of knowledge that I know that I knew; I recall knowing that he was blind, but it was something that was reminded to me when I read over the synopsis for this film. So, with that being said, you can probably guess where it is that this viewing experience ranks among all of my previous viewing experiences. I understand that not every film is going to be extremely entertaining in the sense of action sequences, explosions, and pretty lights; and with a film like this that is pretty limited in its storytelling because it is portraying the life of a real person, there's only so much that they could add in before it crosses the line of authenticity. Even though this film is only based on Bocelli's story and isn't necessarily meant to be a biopic of the singer's life I still think that my point remains. Just from watching this film I got the sense that his life was pretty conflict-free. I don't say that to mean that he never experiences conflict or obstacles in his life, the man went blind at the age 12 of crying out loud. However, in this very real world and also commonly reproduced world of musicians and their stories where coke binges, negative experiences with racism, abuse, family turmoil, or corrupt managers are rampant, Bocelli's story in comparison seemed rather tamed to say the least. (According to the movie) his biggest obstacles were his blindness and the figuring out of his music career. I don't mean to downplay these obstacles because I know that they were pretty important and life changing; they made him who he is. However, when you look at it through a story lens, it isn't the most captivating or intriguing thing. Maybe this is a "damned if you do, damned if you don't" scenario where movies like this have to maneuver that fine line of authenticity and fiction, but I do think that it's a very real flaw that the filmmakers should have been aware of and tried to figure out. If you are a fan of Andrea Bocelli and have been interested in his story, then you may actually enjoy the film. A lot of time is spent on his childhood and who he was before his fame really kicked in, so perhaps that kind of information would be interesting to explore for fans of the opera singer. The acting itself, while I can't speak too much on the accuracy, wasn't horrible. I think they all did a decent job at portraying authentic people/characters. I also, did like how the movie seemed to explore the idea that seeing is not only limited to the eyes; that clarity can come from different sources and senses, but other than that I didn't really enjoy this film. I think it's slowness and lack of a compelling story would be enough to make anyone, fan or not, not entirely happy with the end product. The Music of Silence releases in theaters and on VOD February 2, 2018.